My Parent’s Legacy Scrapbook filled with stories of their life. When my parents celebrated their 50th wedding anniversary in 2004, I gave them a gift that was a disappointment. It came in a large, beautifully wrapped box and contained an empty scrapbook with pretty papers and die-cut numbers of each year of their marriage. They had expected a completed scrapbook of their 50 years together – not an empty book. (I did give them a small scrapbook of greetings from family and friends). My hope in giving them the empty book, was that they would leave the story of their life together. Memories of their family’s milestones, their homes, places traveled and celebrations told as only they could. Catching the the vision, they organized their photos and took on the project. They took turns writing memories of each year, documented with photos. The scrapbook was almost completed when my Mother passed away. The book, along with their other photo albums, then got packed away as I helped my Dad transition. Fourteen months later he pass away too. They were close to finishing the scrapbook and only had several years to complete. I shared with my middle daughter that I wanted the book complete, but wasn’t sure I could do it. Laryssa told me that she would do it someday (when her heart was ready to tackle the project). Someday came this Spring. I had no idea that she was finishing my parent’s scrapbook, until she gave it to me as my birthday gift. Each of their 50 years were completed, along with the extra 8 years they shared together (they celebrated 58 years together). I was overjoyed to see it complete, to view each page of their married life together and to read their memories. This scrapbook tells the legacy of a young couple from Rimersburg, PA who married, had children, buried their parents, traveled to 47 states and 36 different countries. They worked various jobs, had life long friends, enjoyed the holidays and loved their family. Although they may not have lived famous life, to me it is a cherished legacy. 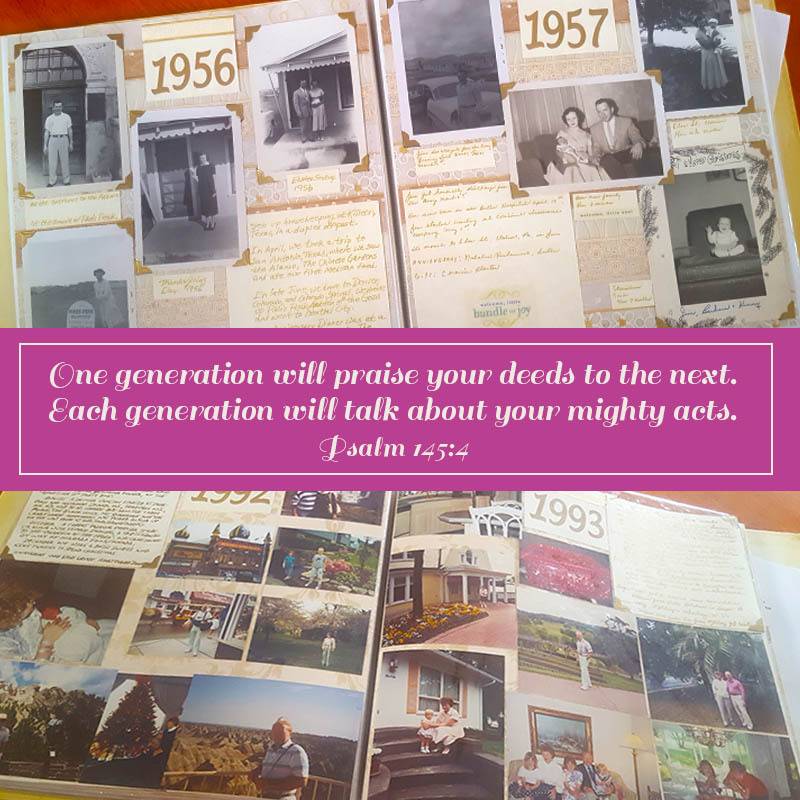 I rejoiced that my parents had left a legacy to tell the next generation what God had done in their lives. What an timeless legacy I now have in my possession. An appropriate example of Recognizing and Remembering God’s faithfulness throughout Life’s journey. How are you telling the stories of God’s faithfulness in your life? Please share with me what you are doing to tell the next generation. What a sweet gift and a great way to remember your parents. That is a wonderful gift. It reminds me that I should be asking my mother some more questions while I have her. I also need to be preparing some remembrances for my children.